Baan Ban Buri is an oceanfront, vacation compound that’s comprised of six pavilions – all exemplifying contemporary Asian elegance. Spaces are appointed with mostly white finished, complementary and intricate, Orient inspired wood furnishings and fixtures with both classic, as well as in-vogue and lavish pieces. Amenities are distinctively five star – to enhance ease and fun for each and every guest. 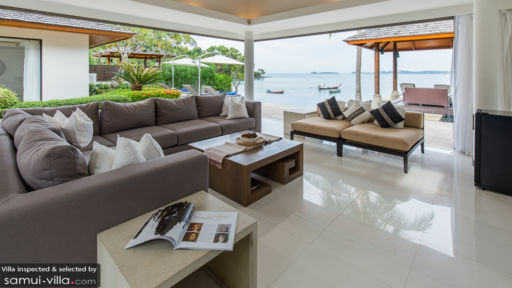 Truly, Baan Ban Buri creates for you an aspirational and well-deserved, exotic break with a seaside appeal. The villa has four air-conditioned bedrooms – each is in its own pavilion. The master bedroom has a four-post, draped, Oriental, king-sized bed, as well as a dedicated bathroom with a fitted bathtub and a rain shower. Two of the guest rooms have king-sized beds, and another guest room has twin beds. All guest rooms have dedicated bathrooms with rain showers. Along the property exterior’s boundary is the 17-meter infinity pool. After getting your saltwater fix, immerse yourself in its inviting, crystal clear fresh waters because you really just can’t disengage from your element’s embrace. For a tan, you can lounge on ergonomic pool beds partially covered by large umbrellas on the poolside stone deck. But when the temperature rises, withdraw to the shade of the sala at one corner of the pool and relax on its cushioned, woven wood couch or day beds – eased by the hypnotic song of the waves flowing to shore. At the villa’s semi-open and airy living pavilion is the living area with its cushioned, wooden benches and hefty, angled couches all oriented towards a wall-mounted, widescreen TV. Here, you can all await the next episode of the newest hit series. Or, replay your best-loved classic film. Bridged by a stone pathway across a pond is the dining pavilion. On its light, timber wood table good for eight, you can all get a taste of authentic local cuisine – as well as international favorites – dished out by the resident chef from the fully-equipped, ultra-modern kitchen at the back of the dining pavilion. The kitchen counter – arranged with high chairs – can also serve as a bar for eats, beverages and cocktails. The villa’s affable staff carries out basic as well as customized services to ensure that – during your holiday – you are – without doubt – having a blast. 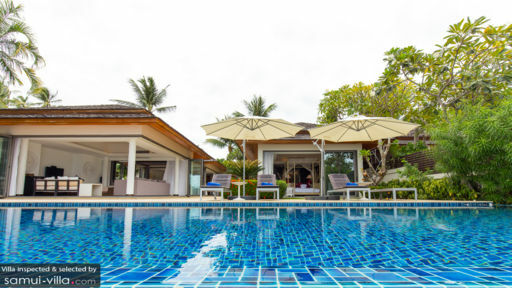 Baan Ban Buri is situated by the beach of Bo Phut. Spend the day getting your saltwater fix, as well as leisurely exploring the two-kilometer shoreline. Inevitably, you will end up at Fisherman’s Village where you’ll encounter its heritage architecture all around and its Wednesday Walking Street. On your next day tour, go sightseeing at the Samui Big Buddha and the Samui Crocodile Farm. Should you prefer something a bit brisk, go see Samui Go Kart or the Bo Phut Hills Golf Club.